This was actually not a MyNewSmile question but was a question we found submitted to another website that we manage. Unfortunately, I don’t think I have a good answer for this poor woman. There is an answer, but I don’t think she’s going to like it. I’m writing this blog post because I think it’s interesting what she has tried to do. First I want to comment on the severity of her gum disease and the hopelessness of trying to get these teeth to stay in, even with crazy glue or superglue. I have seen gum disease so bad that the teeth fall out spontaneously, and to be that bad the teeth already have to be dangling somewhat from the root. 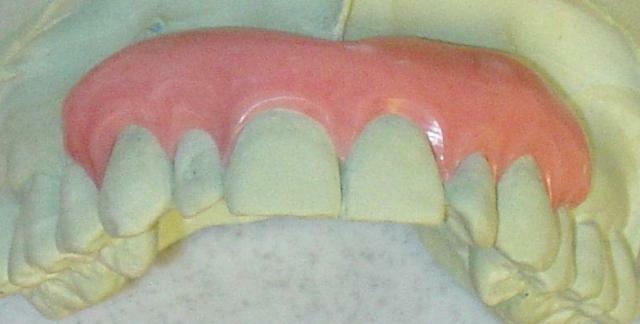 Here is a photograph of the teeth of a patient with advanced periodontal disease. 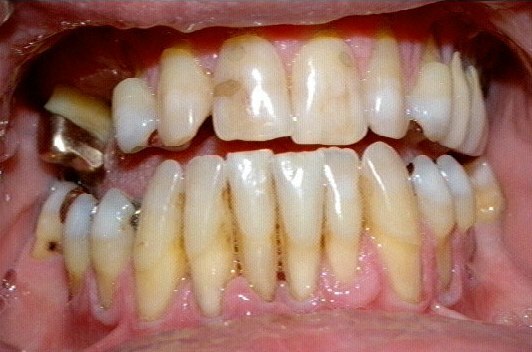 As bad as this is, it’s not nearly the stage of periodontitis that this woman is experiencing. This patient’s lower four incisors are getting close to being loose enough to fall out, but they’re not that bad yet. Imagine a little more of the root showing–this is what this woman had. Putting them back in with crazy glue or superglue? These glues have cyanoacryate, which is is an excellent soft tissue adhesive, but it would only hold for a day or two, maximum, I’m imagining from my experience with it. And the teeth would still flop around. My guess is that it’s been a number of years since this woman visited a dentist. She needs a dentist badly now, and my guess is that none of the teeth are saveable at this point. She needs removable dentures or dental implants. Hi. We have a couple of patients who are in need of a gingival mask; but no labs in our area fabricate them. Can you please give me the name of a lab that we could work with that makes them? For background for our visitors who may not know about the gingival mask, it’s a prosthesis for replacing gum tissue that is lost from severe gum disease, or after periodontal surgery. 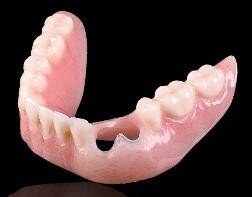 It is flexible and pink, and it snaps between the teeth to cover the black triangles left by severely receded gums. It’s usually made out of silicone, but I’ve heard some labs talk about making it out of soft denture liner material such as Molloplast. A lot of dental labs make these, so I thought you’d have several choices, but then I looked up Mount Shasta and I see that you’re in a relatively remote area of northern California. So I can see where you would have problems maybe finding a lab that would make this. In other parts of the country, you may want to consider Glidewell Dental Lab in Newport Beach, California, where they are used to shipping cases all over the country. They are fairly familiar with gingival masks. While just about any dental lab that makes dentures would be able to make one of these, if you have to explain to the technician what a gingival mask is, that wouldn’t inspire you with confidence. That won’t happen with Glidewell. Question and answer go here. A couple of teeth just fell out! My mother is 85 years old. Just last week she had two teeth filled. She recently lost a tooth and has a partial for that area. Then a few days ago, another tooth fell out. Both missing teeth are from the lower jaw. Fortunately they are in different areas of the mouth. She is very self-consious. At her age, her remaining teeth and gums are probably not in the best of health. We are considering a bridge(s) but are not sure as we don’t know how healthy the rest of her teeth are. Do you have any affordable recommendations on what we can do for the area that is missing teeth? If I am understanding you correctly, these two teeth just fell out. If that is the case, your mother has advanced periodontal disease (gum disease). It doesn’t get more advanced than that, for teeth to be so loose that they just fall out. Continuing on with that assumption, it is likely that she has no really solid teeth left, so bridges would be out of the question. A bridge anchors replacement teeth to the remaining teeth, but in doing so it puts additional stress on those remaining teeth. In your mother’s case, that would hasten their demise. The ideal replacement for missing teeth is dental implants. However, you asked for something affordable. Your mother would likely need full-mouth restoration, and the price for doing that with dental implants could easily get to be $20,000 to $40,000. Given the condition of advanced periodontitis, all of her teeth are likely loose and would be candidates for extraction. I would seriously look at complete removable dentures. The main disadvantage of removable dentures is that it begins a long-term process of bone resorption. But at the age of 85, that would not be likely to be a significant problem for her. Another solution would be a type of partial denture called a Cu-Sil partial that is built like a complete denture, but has holes in it to allow the existing teeth to poke through, and there is a silicone ring in each hole that snugly holds each tooth. This is a little more stable than a complete denture, and as additional teeth are lost, it is a simple matter to then close each hole and put in a new artificial tooth. A conventional removable partial denture also puts extra stress on the remaining teeth. It’s not as much stress as a bridge, but it’s still enough to weaken the teeth, so I wouldn’t recommend that either. So does flossing really help? So the Drudge Report yesterday linked an article from the British newspaper The Guardian about flossing. The link said, “Smile! Now experts decide flossing makes no difference.” The article in The Guardian is titled “Everyone recommends flossing – but there’s hardly any proof it works.” I’m not going to give the article any respect by linking to it–if you want to read it you’ll have to Google it. But I can sum up the article in one word–ridiculous. There is strong evidence through multiple scientific studies that flossing helps prevent both gum disease and interproximal tooth decay. In my dental practice, I could tell whether or not a patient was flossing simply by examining their gums. In fact, the science is so carefully calibrated that dentists can predict how long it would take a patient with inflamed gums to bring the inflammation under control with daily flossing. Two weeks of regular, daily flossing would do the job. In my practice that timing worked every time. And rarely do regular flossers get interproximal tooth decay. But if you go back and re-read the article, it’s fairly easy to detect the slant in the writing. Notice that the article doesn’t say there is no proof. It is titled there is “hardly any proof.” Think that through. That means there is proof. Further along in the article it says: “A major review last year concluded: ‘The majority of available studies fail to demonstrate that flossing is generally effective in plaque removal. '” Notice again the wording, which admits that there are studies that demonstrate the benefits of plaque removal, but it’s not a majority of studies, or rather, it’s not a majority of the studies that were available to the person that made this comment. Well, you may respond, the vast majority of studies in American medical journals don’t even deal with the subject of showering. And this article in The Guardian is so stupid. I am suffering from periodontal disease. I have searched for a cosmetic dentist that does gingival masks in my area and haven’t found one. Would you have any idea what I should search for? My gums have receded a lot, so I have large black triangles between my front teeth. And then I and am scheduled for gum surgery in the near future which is going to make them look worse. It’s a very unsightly thing and seems to be getting worse, and I think a gingival mask would help a lot. Also, have you seen gums come back to fill these triangles in after gum surgery, seems the future of my once nice smile is in jeopardy. I just want to be able to smile confidently again, any help would be greatly appreciated. Here’s the thing on gingival masks. Even cosmetic dentists who do a lot of appearance-related dentistry don’t get calls for them very often, so they’re very unlikely to mention them on their websites. And if you call the office, the receptionist is likely to not know what you are talking about. But any dentist who is seriously into aesthetic dentistry is going to be able to do this for you and do a nice job. The concept of a gingival mask is fairly simple. It’s simply a piece of silicone shaped to fit over these black triangles between your front teeth and colored to look like gum tissue. It has little tags that slip through those black triangles and help anchor it into place. Silicone is used in dentistry for several purposes—soft denture liners for one. So any dental lab that does dentures can make them. And all the dentist has to do is send a good plaster model to the dental lab. So any dentist who is really into cosmetic dentistry should be able to make this. So my suggestion would be to simply make an appointment with any cosmetic dentist that I recommend on this website, and I’m confident they could do this for you. And no, your gum is not going to grow back. Even trying to correct this surgically isn’t really going to work. The gingival mask prosthesis is the only real way to address the aesthetics of your situation, if you have a high lip line that shows your gums. What would you recommend for my smile? I had a huge overbite as a child from sucking my thumb, had braces and was very happy with the results. My problem is that I’ve been told I have periodontal disease and now have a HUGE gap between my lateral incisor and canine tooth and makes my smile look crooked. Your periodontal disease sounds serious. Once your teeth start moving, they are already getting loose and may have lost half or more of their bone support. So your treatment plan is going to have to focus on that first. Exactly what options are available to you, that is going to depend on the severity of your periodontal disease. And your first step is going to be getting your periodontal disease under control, if that is even possible. Your dentist has hopefully made that clear to you. And from there, you need to proceed cautiously. If saving your front teeth is a hopeless proposition, for example, you probably won’t want to invest thousands of dollars in porcelain veneers. Instead, you may want to be looking at getting dental implants, or a removable appliance to replace the hopeless teeth. On the other hand, if the periodontal disease can be brought under control and the destructive processes stabilized, the teeth may be able to be moved back into an esthetic position with braces and stabilized there with some type of splint that will prevent them from moving again. You do want to be sure that your dentist is one of the small minority of dentists who is truly sensitive to appearance-related issues. 98% of dentists have a strong engineering mentality, focused on fixing things. While they are generally honest and skilled practitioners, they are not artistic and would not fully appreciate your concerns about your appearance or be able to give you back your beautiful smile. I would urge you to check our list of screened cosmetic dentists and choose one of those. That is why I operate this website. I am a 67 year old woman who has had surgery for gum disease within the last six months. Also, because of the gum disease I have 6 missing upper teeth (3 on either side). I do have the front six and a back molar on each side. I suppose due to bone loss from the gum disease my front two upper teeth have a major gap between them. At the moment I contemplating either implants but due to the cost that may not happen. I have talked to my dentist about “partials”…currently I have a flipper. I have also been to an orthodontist to discuss braces to close the gap between the top 6 teeth, particularly the middle two. The problem with braces is that the flipper won’t fit and due to the amount of movement needed a partial would have to be remade multiple times. I am not sure if I just live with the gap and get the partial for the uppers and be done with it (even though I am 67, I still work, very active and I HATE that gap). My oral surgeon does do implants but he is talking well over $20,000 and that is a great deal of money. Any suggestions would be appreciated. If you’re going to get this aesthetic problem solved, you’re going to have to get out of this group of conventional-thinking dentists and find a dentist who is passionate about doing appearance-related dentistry. I can think of a couple of possible solutions to your problem that might work, but each one would depend a lot on assumptions about your condition that I really shouldn’t make via e-mail. A specific solution would require a complete examination to let me know the bone levels on the existing teeth, the sizes of your front teeth, the size of the gap, the prognosis of the remaining teeth, and how everything fits together. Now maybe there are no good solutions other than what your oral surgeon is suggesting, given everything the way it is in your mouth, but I can tell you that the prevailing thinking in established dentistry would be that this isn’t that big of a problem and it’s not worth trying very hard and certainly not worth taking any risks. The way we were taught in dental school is that patient concerns like you are expressing over this gap are relatively trivial, and to give them too much weight is pandering and unprofessional. They would not want to APPEAR to be thinking that, but in their professional circles as they talk behind the scenes among themselves, this is the thought pattern that we see all too often. I would suggest getting a dentist who truly believes that appearance is important. Go to our list. There are actually several of our recommended dentist within 30-50 miles of you. They are all screened carefully by me personally to be highly sympathetic to appearance-related concerns like yours and to have excellent skills. I was told I had gum disease and I have no insurance to go back and get this checked. I’m waiting to get some and I noticed my gum in front on the bottom is so low under my 2 bottom front teeth. They have become slightly loose and I know I’m gonna lose them. Please help! If they both come out will my other teeth move forward to fill that gap in? What do I do to save my teeth without having to lose them or get a partial? Gum disease is serious and once teeth become loose from gum disease, there usually isn’t anything you can do to save them. And if some teeth are already loose, others probably aren’t far behind. My advice if you have gum disease is to take matters into your own hands and not depend on dental insurance. Preventing gum disease isn’t that expensive—you just need to be faithful with checkups and cleanings, and then do your basic home care. You would have been much better off had you kept up with your regular dental care. My advice to you now is to go to the dentist and try to slow down or stop the gum disease. The sooner the better. My problem is excessive tartar build-up. My hygienist has asked me to come in every four months instead of the usual six months in an effort to clean them before the plaque hardens further. My teeth cleaning regime includes flossing once a day, using a Sonacare toothbrush for 10 minutes twice a day, brushing with a regular soft bristled toothbrush and toothpaste, and brushing with baking soda (I added this step when I found that plaque is acidic in nature and thought perhaps the baking soda, as an alkali, might neutralize the plaque). All this, and with my four month checkup approaching, my teeth feel scuzzy and I dread the visit to the hygienist, who, I believe, hates to see me coming! Any advice on fighting this plaque/tartar problem? You’re doing all the right things as far as combating this tooth tartar problem. 1. Get your teeth cleaned more frequently. 2. Don’t miss a day flossing or brushing. When you give the plaque more than 24 hours undisturbed, you’re letting it harden into tartar or calculus. 3. The one thing you didn’t mention is a tartar-control toothpaste. Most major brands have a tartar-control formula that will help keep the accumulation of tartar down. Baking soda is good for your teeth and gums, but it won’t fight tartar. And then, to help you understand this issue, I should point out the difference between supra-gingival calculus, which is also called tartar, and sub-gingival calculus. Supra-gingival calculus forms above the gum line, and is visible in the mouth. It contributes to gum disease. But it is relatively soft and easy to remove. When you use the word “tartar,” this is what you’re talking about. Sub-gingival calculus forms on the root surfaces below the gum line and is not visible in the mouth. It is much harder and more difficult to remove, and is not affected by tartar-control toothpastes. It is also much more serious and if left on the teeth will contribute to serious gum disease which will involve the gradual loosening and loss of your teeth. If you have a lot of it, it can take multiple appointments for a hygienist or a dentist to remove it all.